This is the premium version of our E-Nano. It has the same heating engine as all of our other E-Nanos. The difference is premium wood grain. These are hand selected based upon uniqueness and beauty of the wood. The E-nano is the world’s most efficient and easiest to use American made vaporizer. Select your kit options and add-ons below. Choose from Premium Walnut or Premium Maple wood. Heavy duty borosilicate glass replacement stems for the E-Nano. Choose from our adjustable stainless steel screen, long adjustable stainless steel screen, or the all glass honeycomb screen. All come with silicone glow-in-the-dark heat guard. To use the E-Nano with a water piece you will need a GonG adapter. The size measurement is dependent upon your water piece. Black or Silver aluminum stand to hold your E-Nano and up to four accessories (sold separately). Comes with rubber feet. The removable E-Nano power cable to power on your E-Nano. The E-pick is our premium stainless steel multi-tool. 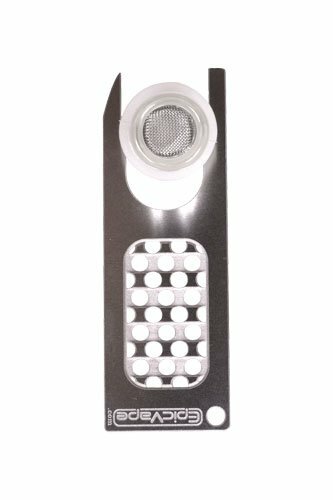 This multi-tool can be used to grind your herb, clean your bowl, adjust your screens and guide you to a proper fill level. The E-Nano Premium Wood Vaporizer Kit you have been waiting for! 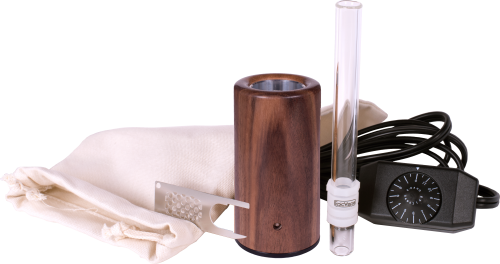 This is the premium wood vaporizer kit version of our award winning E-Nano vaporizer. Premium woods are handpicked for their unique grain patterns and inflections. These are truly heirloom quality. You will not receive the model pictured, but we guarantee you will love everything about your E-nano or you can return it for a replacement or refund. The patent-pending heating engine is the same used in all of our E-nano models. 1 American Made E-Nano in either a Premium Maple or Premium Walnut wood casing. American designed and built = Quality you can see and taste. Hand crafted in the USA from a solid piece of sustainable hardwood = No laminates. Natural shellac finish = No Voc’s no lacquers, no paints. Custom designed 100% ceramic heating element. Rohs compliant. = Clean air path, peace of mind. Fast 2 minute heat up time = No more waiting. Rotary variable power/ON-OFF switch = You chose the temperature from 0-560F. 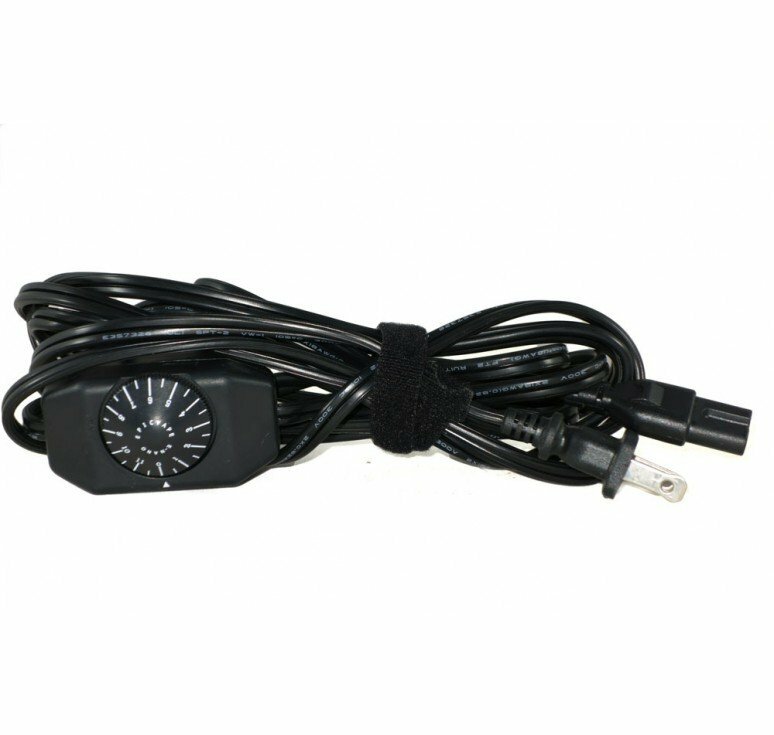 Full ac power = Plenty of power for herbs, flowers, aromatherapy oils and concentrates. 24 hour factory burn in = Ready to plug and play when you un-box it. 3 year warranty = We stand behind our products. Lifetime warranty on the ceramic heater. The E-nano is the world’s most efficient and easiest to use American made vaporizer. Don’t let the E-Nano’s tiny size fool you, our patent-pending heating engine is a beast! Simply load just .025-.05 grams of your favorite herb into the glass stem and you’ll be amazed at the milky clouds this little wonder can produce. Whether you order the standard, premium or exotic wood, all E-Nanos utilize our unique patent-pending heater engine. This handcrafted vape will pay for itself with the amount of herb you will save. We guarantee it. If the E-Nano doesn’t exceed your expectations simply return it to us for a prompt refund (less shipping and handling). I have tried multiple vaporizers over the years. I love this product because it is very simple/durable, efficient and pairs amazingly with water pipes. I previously had a competitor to this unit that had the glass built into the vaporizer, it fell to the floor and died. I dont suggest dropping this on the floor either but it is much more durable than the other unit. I really love the craftsmanship of the unit as well. I definitely recommend the stand accessory for this brilliant vaporizer. My unit is 3 years old and im sure I will get plenty of more use out of it.